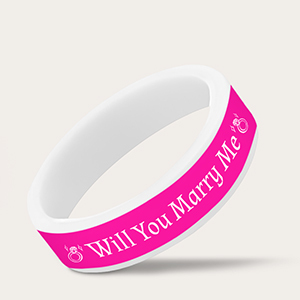 Here at Amazing Wristbands, our versatile silicone rings have a range of uses, from vape bands to a simple fashion statement, but you may not have considered their potential use as silicone wedding rings! 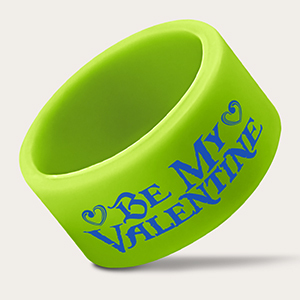 While some people might think you have to splash out on expensive tokens of affection and commitment, why not opt for a more heartfelt, and stylish, silicone wedding ring? This is a quirky, fun option that will help you and your partner start a lifelong journey in the best possible way! It also means you shouldn't panic too much if you lose or misplace one - why not buy several? It will still work out considerably more cost-effective than a regular wedding ring. Since our rings are fully customizable, almost any design you can think of can be implemented quickly and easily. If you want a personal message of love then it couldn't be simpler to create a meaningful product that has great sentimental value. Made of the highest quality silicone and free of latex (great for allergies! ), there's never been a better time to get your very own wedding rings. Design yours today and we'll get them to you in time for the big day!